Annual General Meeting followed by Short Talk by Nargisse Benkabbou - author of ‘‘Casablanca – My Moroccan Food’’ Then festive drinks. Note: Registration is now closed as we have reached capacity. 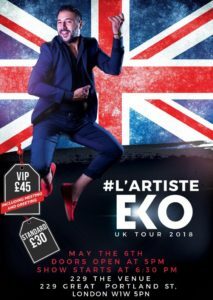 Sunday 6th May 2018 Doors: 5PM Show: 6:30PM Tickets: VIP – £45 + £2.50 booking fee General Admission – £30 + £2.50 booking fee Tickets available here.